As in all European Capitals Bratislava is rich in history and beautiful buildings. But, often tourists end up seeing a lot, without really knowing what they see and why it is so special. A private guide can help you with this challenge, as he/she escorts you at your own tempo and emphasises the subjects that you are interested in. We can help you arrange a three hour private guided tour on foot in where you get to see the most important sights of the Slovakian capital. 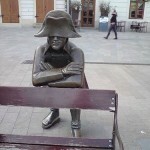 The tour starts from your hotel/apartment, and during the tour you will walk in the old town of Bratislava and get to know the history of the city while you see famous buildings and get answers to your questions. If you would like such a trip, continue reading and book your private guided tour today. The entire amount needs to be paid upon registration (we will send an invoice which can be paid with VISA/MasterCard/PayPal). If cancelled more than 7 days before the trip the entire amount will be returned. If cancelled more than 1 day before the trip 50% of the amount will be returned. If cancelled less than one day before the trip, 25% is returned. In case of a no-show, no money is returned. If you would rather book such a trip from someone else, you can find a wide specter of guided tours in Bratislava at the websites of Viator.